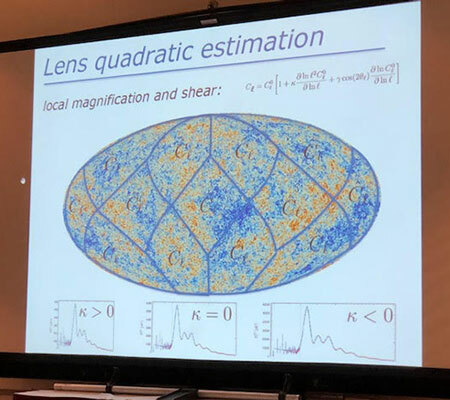 Palmia Observatory: COSPAR Day 6: Water Worlds and search for life; Resident Astronomer takes IR selfie; Planck CMB team and analysis; Inflation? COSPAR Day 6: Water Worlds and search for life; Resident Astronomer takes IR selfie; Planck CMB team and analysis; Inflation? Well here we are at day 6 of COSPAR and this morning's plenary session was on ocean worlds of the outer solar system and later session on other space research topics kept us busy all day long. I am pretty tired, so I hope these comments make sense, but nonetheless still plan to hold in there until the last day and write one more COSPAR summary tomorrow. Professor Alexander Hayes, Cornell, told us about the icy and watery and ocean worlds of the solar system and the search for life on them. 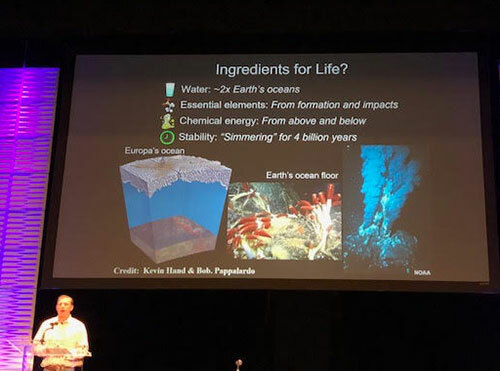 The slide below shows his introduction to chemistry of life, as we know it, and of possible signatures to look for as the search on those planets and icy moons goes forward. So where are his favorite places to look for life? 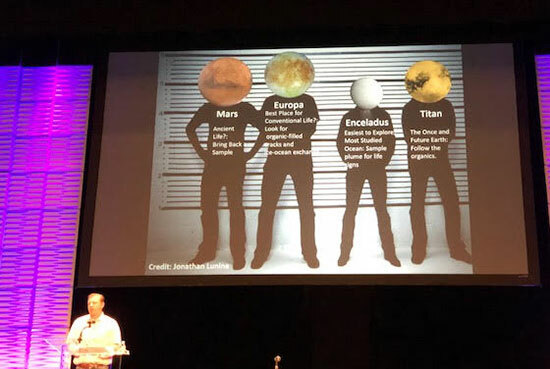 The usual suspects, as shown below, are Mars, Europa, Enceladus and Titan. 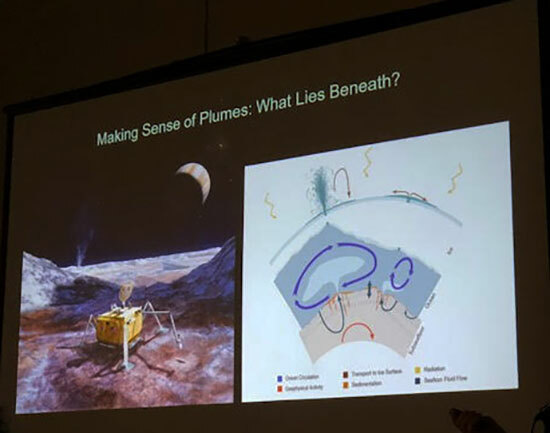 Several presenters also included the asteroid, Ceres, not because it has ever been considered to have life, but because it is thought to be an object with a lot of water in its past and that it is a great place to look for how water arrives on a planet, where it hides, and where it goes. 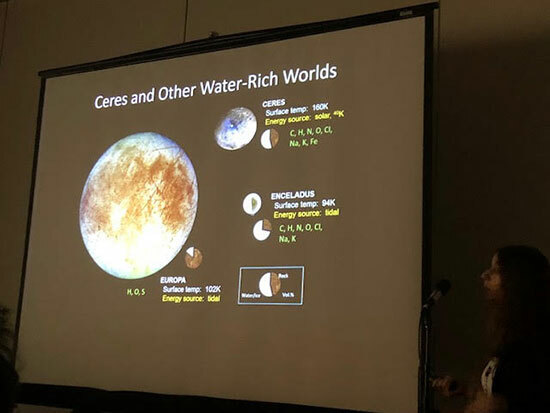 Julie Casdillo-Regez made the case for considering Ceres as a good location to learn about water in the solar system. Also getting a spacecraft to Ceres and returning a sample would be much easier to do in terms of spacecraft design than would a similar project to the other outer moons. She also introduced us to the energy requirements for water to be in liquid form on these water rich worlds. Solar energy works fine for Earth and tidal forces works to maintain liquid water on some of the ocean systems on the moons of Jupiter. Both types of energy, either solar or geothermal energy, separately or together, can provide the thermodynamic conditions to support the basic known life processes in a liquid water world. Professor Christopher German told us about the many ongoing studies that build models of how the water, from these frozen worlds with inner oceans, can be transported to the surface. Many people then look at how the contents of this water would be modified as it is transported to the surface and how any life or life signatures would be modified or lost during that rise to the surface. This whole topic is key to understanding if just flying through the plumes ejected by some icy moons is going to be a reliable indicator of what is actually going on in the ocean below. Ok, that is not to bad for a morning session and now it is time for a coffee break. 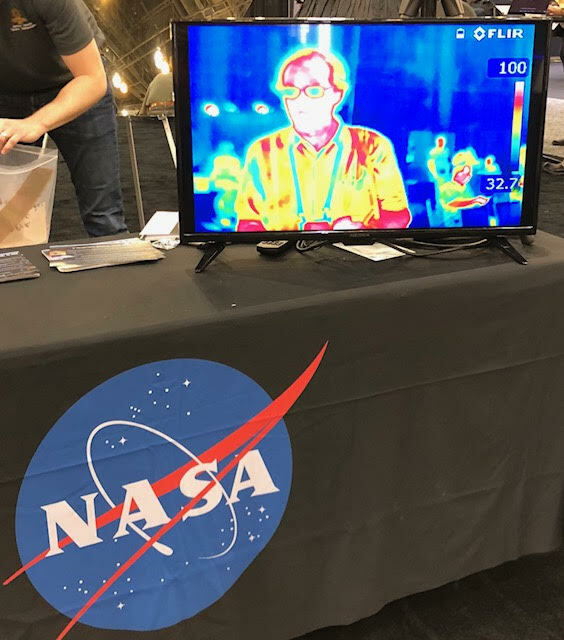 While picking up some coffee, I managed to get in front of a NASA exhibit and an infrared camera. So, here is my selfie in infrared. Hmm, I wonder if that what "tired" looks like in infrared? Sometime after coffee and before and after some other sessions and after lunch, it is all becoming sort of blur now, I made it back to some more sessions on the latest release of Planck CMB measurements. We have all seen those pretty pictures of a nearly uniform microwave sky at about 2.7 K, but what we miss out on is all of the work and analysis to transform the raw microwave measurements by the Planck satellite to the final pretty pictures and cosmological parameters that can be derived from those measurements. On session that I sat in on talked about some of the corrections that must be made to the raw microwave measurements. Of course, we understand that the bright objects like galaxies and quasars and some stars must be removed from the data. Another effect thus must be investigated and corrected for is the effects of gravitational lensing. Yep, the microwave signal that comes to us through space can be bent and distorted by large clumps of matter. Gravitational lensing can help us see the real mass, including dark matter, that distorts the light coming from distant sources. The Planck team can also use this effect to its advantage but they need to make sure they also correct for any gravitational distortion. So much of the analysis requires many statistical tests and algorithms to find any systematic errors and check for consistency. Many of these presentations were so technically statistical that they were probably only understandable by the real experts, and not physicist wannabes like myself. One question that I had hoped to get a more final answer on is whether we are getting closer to finding better confirmation of inflation. We know that inflation is a convenient solution to the flatness and uniformity of the universe, but there is little independent confirmation. One Planck paper confirmed that inflation, as least the simple, slow roll types of inflation theory, are consistent with the CMB data. Other more complicated inflation models are found to be not consistent with the data. Hmm, I guess that is sort of something like progress! 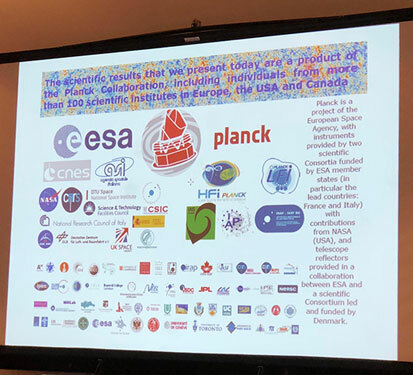 Finally, we should consider this following slide which shows the large number of teams and countries that make up the Planck collaboration. The team needs a combination of theoretical and experimental scientists and engineers to design the microwave instruments to meet the demanding requirements of measuring the CMB at its expected value around 2.7 K. A whole team of satellite designers and operators is also needed. 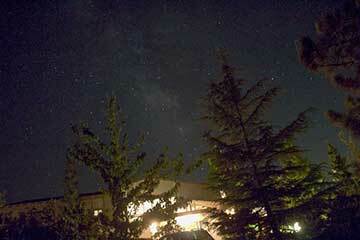 The team also needs cosmologists who can analyze the data and statisticians that can set confidence limits. This is how science gets done now.